Well, it was kind of a disaster the last time I went to Giants stadium, both on the field and off. The Eagles got clobbered, and my night may have included some unnecessary heroics. Both the Eagles and I survived the evening, but only barely. Thankfully, my then-fiancee was there to witness it, and she still married me. I wasn’t kidding when I dropped the Terminator jokes about the Giants this week. That they played so well in the middle of all the nonsense last weekend was actually pretty unnerving. Shouldn’t they have been at least a little bit distracted? And to go on the road against a tough divisional team on Sean Taylor day, I mean, yikes. THEY CANNOT BE REASONED WITH. THEY DON’T FEEL PAIN. If they actually show up and play well again this week, well then I think we can consider Tom Coughlin for Hank Paulson’s job. It’s just very difficult to argue that Tom Coughlin isn’t doing the best coaching job in the NFL right now. It’s impressive and commendable as a management exercise, and it’s not like I’m eager to say nice things about the Giants. These guys are good. The rest of the RBs. No Buck, so the Birds will be one gimpy #36 ankle tweak away from Lorenzo Booker and Kyle Eckel gamely attempting to pick up Steve Spagnuolo’s blitzes. I’m sure it’ll be fine. Obligatory Plax impact. Yup, Igglesblog had it right, it’s silly to pretend that the Giants won’t miss Plax. Against some other teams, it’ll matter. Against the Eagles, it shouldn’t, unless the Giants’ offensive line doesn’t play well. That is, it makes sense that the Birds sell out against the run and hope their secondary can hang and Eli doesn’t have a big day in the cold and wind. But I actually think that the Giants will still run well against a stacked Birds line. That which I envy second most about the Giants. It’s not that the Eagles are afraid to spend expensive draft picks on defensive linemen. They just didn’t manage to pick Justin Tuck. He’ll only be killing the Birds for the next five to six seasons. While similarly branded, Victor Abiamiri and Trevor Laws aren’t quite the same thing (though both went higher in their respective drafts). As dominant as the Giants’ defense is. Huh, the Eagles actually have three more sacks than the Giants this year (the teams are 3 and 4 in the NFL rankings, respectively). We’d all be very surprised if the Birds weren’t at least minorly successful against the Giants’ passing game. I’m having happy flashbacks to the 2006 game at the Meadowlands that ended with Trent Cole returning a pick for a TD. If nothing else, I expect we’ll be able to say nice things about the 2008 Eagles defense. Do they show these ads everywhere? The Eli Manning “Unstoppable” ones? Please tell me I see these just because I live in New York. Yup, I’m calling it the Meadowlands. Doesn’t it seem like everyone’s a little slower on the Meadowlands’ turf? Or do I just imagine too many late-season games when I think of the Meadowlands and everyone looks slower in the cold? No one can say the Eagles aren’t getting their shot. The season could end today at the Meadowlands. Given that there are 3 games remaining, that would be, um, disappointing (though not entirely surprising). Yet the Eagles probably won’t be the last team to have their season end on the road against the Giants. Even if the Eagles explore the edges of quantum possibility and sneak into the playoffs, any significant success will involve a trip to the Meadowlands (yup, going to keep calling it that). So today is as good a day as any to see if the Eagles are really anything more than last year’s 8-8 team (but with a better punt returner). What I’m wearing. 20-30 mph winds at the stadium and temperatures in the 30s? We’re going to need to layer. Also, we’re going to hope that the Eagles don’t try to throw it 55 times. End of the turnpike/ road. We have to acknowledge that this is likely the last game that Donovan McNabb, Brian Dawkins, Jon Runyan, and Tra Thomas will play as Eagles at the Meadowlands. It might be the last game that some of them play as an Eagle. I’m happy to absorb some abuse in the stadium to see it live. My predicted final score. So I definitely like the Eagles to cover 7 points (if you’re interested in such things). They got a couple extra days off, and this week’s events have to have some impact on the Giants, right? But can the Eagles actually win? I’m not convinced. And I really really really wanted to be convinced. There’s a best-case scenario where the Eagles bring everyone to the line of scrimmage and dare Eli to throw the ball against them in the wind and it somehow works. The flip side of that scenario is that I don’t know how the Eagles are going to score in windy conditions either. I just can’t believe that anything but the totally predictable will happen today. That is, I can’t believe that the Eagles will stop the Giants from running and somehow manage to score a bunch of points on the Giants’ defense. Final score: Giants 27, Eagles 21. Off to Jersey and the ancestral homeland. Go Birds. In a game that couldn’t have gone better for the Eagles (save for Max-Jean Gilles getting hurt), all the flailing parts of the team suddenly looked competent and the team rolled over a Cardinals team that wasn’t actually ever in it. The quarterback was accurate and focused, the running back looked spry, the offensive line played their best game in months, the wide receivers held onto balls that didn’t hit them square in the chest, and the new-look secondary made a bunch of plays against the best wide-receiver combo in the league. Oh no, this is going to make Andy Reid especially smug, isn’t it. Let’s see, capture early lead throwing the ball, force other team to throw, run the ball against humiliated, desperate defense, pin ears back on defense, cruise to victory against tired opponent. Great. You were right all along, Andy! Feel free to chuck it 55 times against the Giants. The road to 7-8-1 is paved with wins like these! The lines came to play. When was the last time the Eagles pushed another team around this thoroughly at the line of scrimmage (on both sides of the ball)? I can’t even remember. The play consistently took place on the wrong side of the Cards’ line of scrimmage. I guess the boys on the offensive side must’ve really taken those anonymous comments to heart. The Cards must have really suffered in the short week. Must not have been time for a lot of film study. I mean, how else to explain not seeing the shovel pass? Everyone in the Delaware Valley as well as each of the Birds’ NFC East opponents knew that was coming. Comical. Looks like opponents are taking the CamelCased One seriously. Dare we say more seriously than the 36 Chambers of Brian Westbrook? The Cards completely overpursued Jackson on the fake end-around that Westbrook took down to the three. Huh. Can’t say we hate that. I hope Lito Sheppard doesn’t have trouble selling his house. Let’s see, undrafted free agent Joselio Hanson not only starts but picks off a pass, and Lito Sheppard had the coverage on not one, not two, but all three Cardinals’ TDs. Looks like we’ve found the weakest link. Pass me a vial of whatever they stuck in Brian Westbrook. Didn’t look too gimpy last night, though most of his running was vertical and between the tackles (not a lot of stretch plays or sweeps). Whatever. It was a treat to have B-West making plays. And we’re off. Actually hitting up the Flyboys this afternoon, and looking forward to it. Oh man, that Occam’s razor is a b*tch. Amidst a week of Andy-and-Donovan-must-go, the most shocking news I’ve heard is the revelation that Brian Westbrook is more banged up than we may have thought. Whether it’s in pieces like this one or on Brian’s weekly radio show, it’s pretty evident that the Eagles’ erstwhile best player is hurting — and that he isn’t likely to get better any time soon. There has even been mention of — gasp! — the Dread High Ankle Sprain, which we all know to be among the most mysterious and crippling of the football injuries. 1. We’re not allowed to be shocked that the Eagles aren’t exceptional running the ball if the two guys who made the Pro Bowl last year — and who are pretty important in the running-the-ball thing — are missing or very banged up. This is the simplest answer. We are allowed to be shocked at the coach’s reaction to those events and his lack of a back-up plan. Even if you’re not exceptional, you still need to be effective. Yeah. Let’s not think about that too too much. In other news, Dunavin faces the blathermonkeys shortly. I hope he has a plan for explaining away the tie thing. And I hope it has multiple references to being “ambushed” by “gotcha” questions from the “liberal elite.” Don’t ever let them see you sweat, big fella! Okay, we’ve all had the chance to sleep off last night’s loss to the Giants. And…yeah, it still isn’t sitting well. The response to the game has justifiably focused on some of the Eagles’ decision-making in the second half, but hey, let’s not be stingy with the blame — there was plenty to frustrate fans in last night’s game. So much for the post-World Series afterglow. Baseball? World Series? Chase Utley? Cole Hamels? That’s all well and good, but ANDY REID WASTED HIS CHALLENGES! THE MIDDLE-OF-THE-ROAD EAGLES LOST TO THE DEFENDING-CHAMP GIANTS! PANIC! DESPAIR! More Dunavin, pukey edition. I assume everyone else cracked wise as the Eagles let the clock tick down to the two-minute warning as Dunavin was visibly panting on screen? Something along the lines of “At least he didn’t puke”? I think Michaels and Madden even joined in. On this night, even the most ardent McNabb apologists were sent scrambling for higher ground. He was 17 of 36 for 194 yards and three touchdowns, but don’t let that last number fool you. His interception in the second quarter was as bad as you’ll see in the NFL, a league that Brad Johnson and J.T. O’Sullivan still call home. McNabb rallied his team late, but it only served to highlight how poorly he’d played the rest of the game. Yeah, tough night for McNabb. But he wasn’t the headline, and it strikes me as a bit lazy to write the blame-the-QB piece after a loss (note: the Eagles did score 31 points in said game). Especially when the defensive line was humiliated and the offensive line couldn’t push forward for a yard when they had to. Note also that there was nary a word of criticism of Big Red in that piece — I guess Mosley is planning for the long term with his blame allocation strategy! Better not piss off the big guy! Saying the unsayable. Was Westbrook a little dinged up last night? Are we allowed to suggest that maybe the 2008 Westbrook isn’t as impressive as the 2006 and 2007 editions? Also, are we allowed to write columns about how he couldn’t get two yards when he needed to? To his credit, he owned up to it in his post-game comments, but no one in the press really bit. Also, it’s worth checking out those comments to see that he also semi-distanced himself from the play call at the end of the game. Boneheaded plays aren’t reserved for coach, QB. Greg Lewis. Dude. Running into the punt returner? It’s a tenuous hold on a roster spot as it is. You don’t need to be handing the Giants 15 free yards. Also, the Tank Daniels encroachment call (that could have ended the game) was the moment were I actually lost my temper a bit. Horrible. Yeah, still stewing on this end. I’ll come up with something positive later today. For now I’m content to wallow a bit more. As I’ve already covered the top-shelf storylines and offered a proposed final score for the Eagles - Giants game tonight, I apologize for the high miscellanea-to-actual-football-content ratio in this post. But it wouldn’t be the Giants game if I didn’t spoil myself a bit. So in addition to the overeating I’m planning for the game tonight (pulled pork that I’ve been slow-cooking for hours, mac and cheese, cole slaw, cocktail weenies, pecan pie — yeah, bad), I’m also treating myself to a bonus game preview/ football Sunday post. Feeling oddly at peace in re: Plax. I’m typically paranoid about Plaxico Burress ahead of Giants games, but this time I’m feeling pretty relaxed about him. Not that he isn’t a great player who seems to enjoy Eagles-killing plays, but I guess I’m just taking it for granted that he’ll score against the Birds. As in, there are plenty of other things to worry about that might not actually happen; it isn’t worth sweating the givens, however disagreeable they may be. Just to repeat in re: top-shelf storylines. Yup, I’m just as apprehensive in re: the Birds’ ability to handle the Giants at the line of scrimmage as I was yesterday. Just checking in on that. Early test of the post-Phils afterglow? Now that the Phillies have won, we’re all supposed to be relatively mellow about the other teams for a little bit, right? As in, the Phightins won the World Series, so we all should have a sense of perspective w/r/t the other teams in town. Yup. Looks good on paper, doesn’t it. The Seahawks were a pretty easy landing last weekend, but bringing in the Giants for a primetime game at the Linc just a week later? That’s a cruel, cruel test of the constitution of our Sports Feelings’ Soul. And I wish I could pretend it was one I wasn’t going to fail miserably. Update your bookmarks. Ugh. Enough with the splash page on the Birds’ official site. 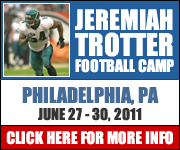 That splash page is the Saved By Zero of philadelphiaeagles.com. You want “index2.html” to go straight to the content. Speaking of, they’re pushing extended online coverage of tonight’s game on NFL.com — need to make sure I keep an eye on that. Speaking of game coverage. The Jets were the Fox early game in New York. That would be the 40-0 at halftime Jets game. Fox stayed with it until halfway through the fourth quarter (it’s the home team, I know, they have to, but still). Yawn. If the NFL was willing to sell me more games, I wouldn’t have flipped the channel to a very exciting MLS game (Allez les RBVs!). Oh well. Things I’m dreading ahead of the game. Brian Dawkins getting turned around and then run over by a Brandon Jacobs with a bit of momentum. McNabb losing a fumble on a sack. The Eagles throwing eight times in a row in the first quarter. A David Akers miss. Wasted timeouts due to jumpiness in re: blitzes. Things I’m hopeful about ahead of the game. DeSean Jackson going out of his way to make a big play on national television. A more mobile McNabb extending plays. A stout game from the Eagles’ defensive tackles. A pick from Omar Gaither. Continued heroics from Juqua Parker. Brian Westbrook’s deep personal animosity for the New York Giants manifesting itself in many many touchdowns. And that’s what I’ve got for you. Off to negotiations with the pulled pork. Go Birds. So which Philly sports fan isn’t hungover this morning? After a crazy late-night ending for the Phightins, the Delaware Valley should be flooded with happy brain chemicals this morning. I can’t believe that I’m saying this, but the Birds game this afternoon actually feels a bit inconsequential. I mean, I’m going to leave the comfort of my home to watch it, and I’m sure I’ll get swept up in it once it starts, but, really, I’m definitely preoccupied by the baseball right now. And I imagine I’m not the only one. I hope the Eagles have a Pittsburgh-game-level commitment to defensing the run. I hope the Birds are excited about tackling Michael Turner, because they’re going to spend most of the afternoon doing it. Turner is definitely a fantasy start this week. The Falcons are silly if they don’t spend the afternoon handing off. Similarly, I hope Andy Reid indulges himself. Football Outsiders have the Falcons as 27th against the pass. No one’s going to complain if McNabb throws the ball 35 times. Welcome back, Kevin Curtis! I hope it’s a big day for the Birds’ wideouts, Curtis included. I hope they don’t just ease him back in — none of us would hate a deep ball to Curtis. Abiamiri watch. They said he was going to play a bit more, and I’m excited to see it. If they thought this guy was better than Parker, then, well, I’m more than a bit curious. Wasn’t he supposed to be the big end who could play the run? The Birds will likely need that today. It’s probably just the lingering Phillies endorphins talking, but I think the Eagles will win in a game that will feel a lot like the San Francisco game — the Falcons will hang around and create moments of darkness and despair for the good guys. But I think the Birds will have another big fourth quarter and get it done. Eagles 30, Falcons 20.